Our Organized Play Kits are now ready and include some incredible exclusive playmats and Organized Play Packs. 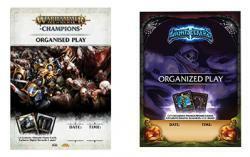 This Organized Play series will last for 6 weeks and one kit will feature 2 playmat designs, 1 for Order and 1 for Death. As mentioned, these kits will also include our new Organized Play Packs. The cards included in this are already available, however, each will feature limited edition card art. Each Organized Play Kit will include 24 individually sealed packs, each containing 1 card from a possible pool of 12. There will then also be a 1 in 4 chance that this card is foil! These kits will be free of charge but will be limited to 2 per store. Organized Play events can begin Friday, 19th October.